Knowing your blood type or even just thinking about it is not exactly the sort of thing that just pops into your head during the day. Well that’s until you understand just how much of an impact your blood type actually has on many aspects of your life. 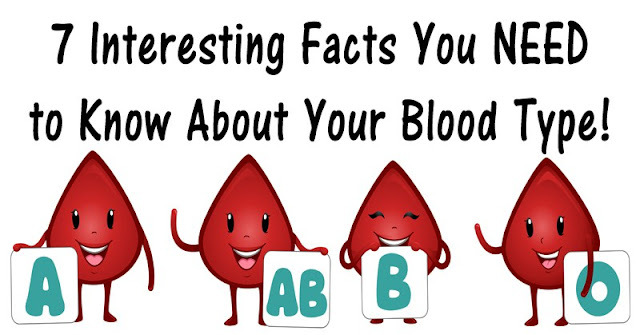 We have outlined a few amazing facts about you and your blood type. Here’s 7 crazy facts that’ll definitely leave you with a new appreciation for the blood running through your veins! 1. Your blood type affects what food you should be eating. Naturopath Peter J. D’Adamo confirmed various blood types result in varying nutritional needs. People with Type O blood tend to have digestion and stomach problems. As such, they require a high-protein diet with plenty of lean meat, poultry, fish and vegetables. Type A individuals have a sensitive immune system and should eat lots of citrus and vegetables like broccoli, spinach and garlic. 2. Your blood type affects your personality. Asian medicine has documented this fact for some time. People with Type A blood tend to be kind, compassionate individuals that put other people’s needs before their own. Type B blood is often found in individuals who are outgoing, friendly and emotionally flexible. Type AB individuals tend to be rational and strong, with very little worry. Type O individuals, on the other hand, tend to worry a lot and are very practical and organized. 3. Blood type also affects fertility. Women with Type O blood have shown in studies be the least fertile. The study, which looked at several women in their 30s, found that women with that blood type either contain few eggs or eggs that have a hard time maintaining fertility. 4. Stressed or angry all the time? Check your blood type! Because people with Type A blood produce more cortisol than normal, their stress levels also tend to be higher than average. People with Type O blood are more susceptible to outbursts of anger. 5. Blood type affects the amount of belly fat you have. Type A blood causes acid reflux, an increase in diabetes risk, bloating and indigestion. Itcauses the body to react badly to specific foods like dairy, meat and shellfish. That reaction makes it difficult to lose belly fat. 6. Blood type also affects your pool of ideal mates. In addition to ‘letter’ types, blood is also classified as either Rh negative or Rh positive. 85% of all people are Rh positive, and when two Rh+ people mate, things go smoothly. Problems arise when an Rh negative woman mates with an Rh positive man. This exposes the baby to potential risks. Rarely is it fatal – but it can be. 7. Knowing your blood type can save your life in the future. You could require a blood transfusion. But unless you’ve got documentation signifying what your blood type is, doctors won’t be able to quickly tell what kind of blood you need. Transfusion with a blood type different than your own can lead to a number of complications, some of which can put your life at risk.